Renzoni: Best Jarred Tomato Sauce Ever? However, I'm no fancy-pants purist either. Sometimes you need a quick fix, a jar of red stuff to dump on spaghetti. On a recent trip to Temecula, which just hauled in the best harvest it's had in a decade, I discovered Robert Renzoni Vineyards. 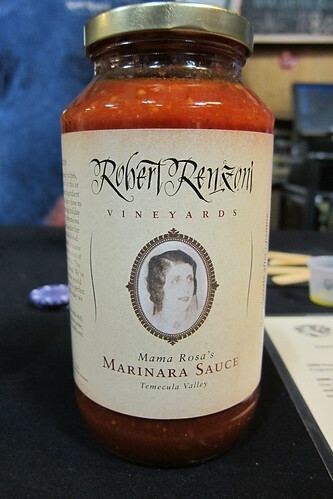 In addition to making a lovely Old Vine Zinfandel and a slew of other hearty, Italian-style wines, their Mama Rosa's Marinara Sauce is one of the best jarred tomato sauces I have ever tried. A touch on the sweet side but nothing like the sugary goop that defines most mass-produced tomato sauces, Renzoni makes a coarse blend (supposedly based on an old family recipe) loaded with garlic, shallots, basil and other spices. Anchovies round out the blend, giving it a depth and tang you wont find in most sauces, at least not the ones on grocery store shelves. They haven't yet added the pasta sauce to their website, but you can buy jars at the Renzoni tasting room or order by calling them ($11.95/jar + S&H). Robert Renzoni Vineyards: 37350 De Portola Rd., Temecula. (951) 302-8466. www.robertrenzonivineyards.com.